I don't collect 6in or 3.75in but this is pretty sweet. 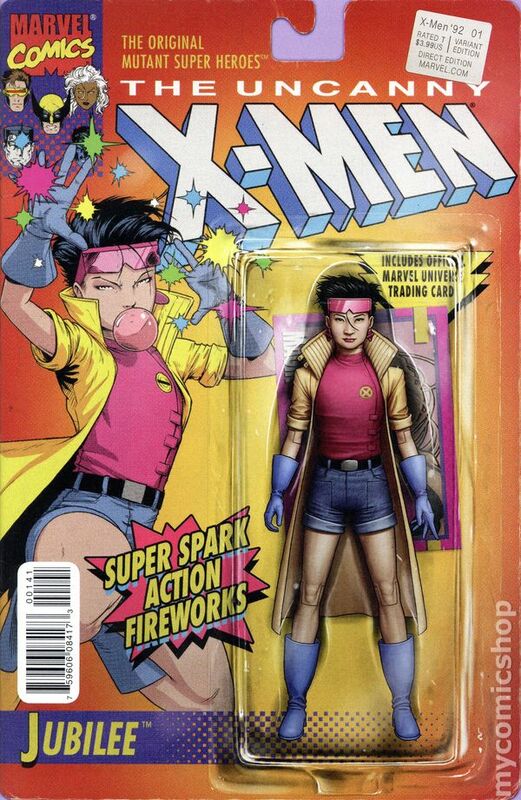 Reminds of the Toy biz Xmen vs Street Fighter and Marvel Vs Capcom 2 packs. Wow, Hasbro is doing figures of Capcom characters...shades of Toy Biz back in the day. I wonder if they're doing more figures in addition to these? Gotta echo the Toybiz memories. This is great, and a really easy purchase for me. Now I miss my old War Machine and Mega Man figures. Oh, I forgot about these. It's a bit sad that I can't see this going far enough to cover the characters the game has and even if it did there wouldn't be any character in there I need as a figure, Infinite's roster is terrible. I think it IS the 4" Mark 3 figure from the Iron Man 2 line. Toy Biz fans - join our conversation on "mutating" the entire Marvel 3.75" toyline - to a more nostaligic flavor. Toons and toys surely also bred many a Millennial. X-Men the 1992 Animated Series was born 25 Years ago. If the (pictured) cosplayers are age 25, and enjoyed toons in 1992-1997, then its perfect timing / perfect sense. Millenials are those same kids, who enjoyed those kid toons and kid's toys. Made a success out of Toy Biz. They genuinely geek-out when I go to the register and cashiers beam at MU Jubilee, Jean Grey, Rogue, Storm, Mystique, etc. Millennials can positively help "our" 3.75 inch toyline. Especially if carded like "their" good old Toy Biz. Sold! I hope they do Chris and Dante. Doesn't matter who they come with just want those two. Unless X comes with accessories, I will probably pass on this. If the Capcom figures wind up being worthwhile, I'll probably pick up at least a few of them. X is a good start, and I'd be in for Dante and Arthur as well. Even if they mostly repaint the existing Universe/Legends Marvel figures. ^^ Ditto. Getting some decent Capcom figures are worth a couple of Marvel repaints/repacks imo. Will these be in 6 inch? Or just 3 inch? In before "This BETTER be 6 inch" comments. I wonder how far into the line they'll do them for? Tempted to get them. I cannot find any info beyond Target is getting the exclusive 2 packs. Hoping that these are going to be 6 inches in a single card release. I brought this up over in the 6" Legends thread, but I figured I'd mention it here, since questions about the 3.75/6 inches scale keeps coming up, and I'm gonna put myself out there on a limb and say that these are of the smaller variety. Here is a link to the statue in question. If that is indeed the statue, the statue when completed would stand around 18 inches tall, meaning that the box or the figures don't quite scale up to it properly in order to be of 6 inch scale. If these figures are not 3.75", it is possible that they could be of a different scale altogether, like the animated 7POA GoTG and Spider-Man animated figures. 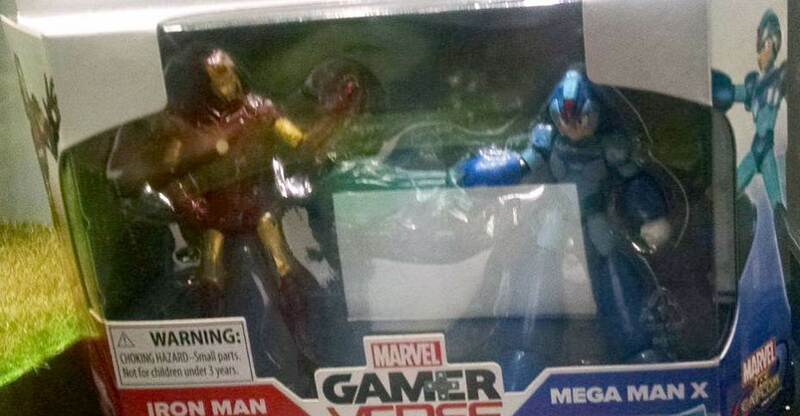 Some other signs that these might be of the 3.75 scale variety include the appearance of MegaMan's articulation not featuring an ab crunch, a lack of double jointed arms and knees consistent with 6 inch Legends (it appears to be on a swivel,) and the Iron Man appearing to be a re-issue of one of the older 3.75 movie figures. Much of the articulation that we can see appears to be more consistent with the smaller line. Another poster on the thread also mentioned that the pegholder tab on the box is another giveaway, as the Iron Man's head could very easily fit into it, which is not possible for the 6 inch Legends figure. Most pegholder tabs shaped like this tend to be a one size fits all gig, so it could be the most damning piece of evidence next to the Ryu statue. Also, I should make a note that most of the 6 inch Marvel Legends double and triple packed figures tend to not have built in hanger tabs on the box. Due to the weight of the packages, along with the fact that they are meant to be collector friendly, they are usually meant to be and are displayed on shelves. Should a store decide they wish to hang them, they will usually apply their own, stick on tabs. Nothing I'm saying is set in stone, but I really do believe that these are more in line with Marvel UNIVERSE figures, and not Marvel LEGENDS. Curse Hasbro for changing the Universe name to their most popular brand's name, as all it's done is cause confusion down the line. They're MU sized and will have "good articulation". Can't wait to see who else they make. Unfortunately for the Marvel figures, I think they will all be re-packs/re-paints. The Marvel side of the current MvC line-up all pretty much have figures in the 3.75. I guess that'll be good for the Capcom figures, because many will need all new sculpts. Sad, but true. I vastly prefer Avengers over X-Men, but a MvC game without X characters is wrong, plain and simple. It looks like a cool game too, but I won't be getting it. This two-pack is the best news I've heard so far. I'm guessing we'll get Hawkeye, Spider-Man, Doc Strange, and any character on the Marvel side who already has a 3.75" figure. 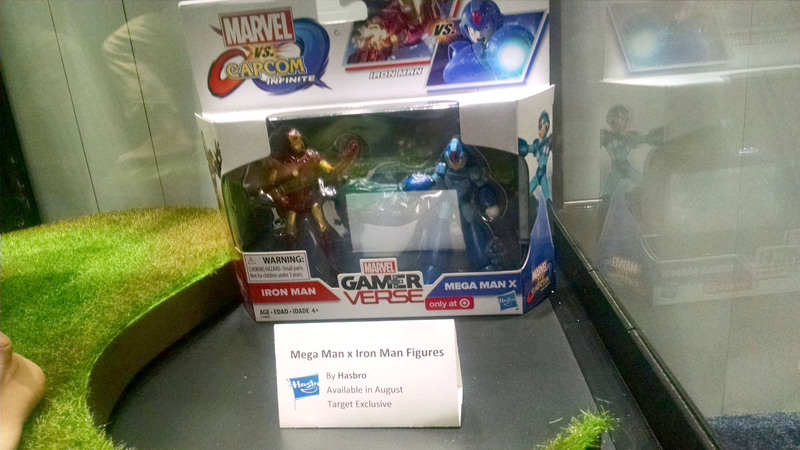 Hasbro is claiming that the Mega Man is highly articulated. I think Marvelousnews reported this. We will see. Mega Man is fine, but not my first choice.